My ABC Loves and I just cannot get enough of each other, as you will notice from my recent blog posts. We just love hanging out so much, that whenever we get the chance to we just go for it. 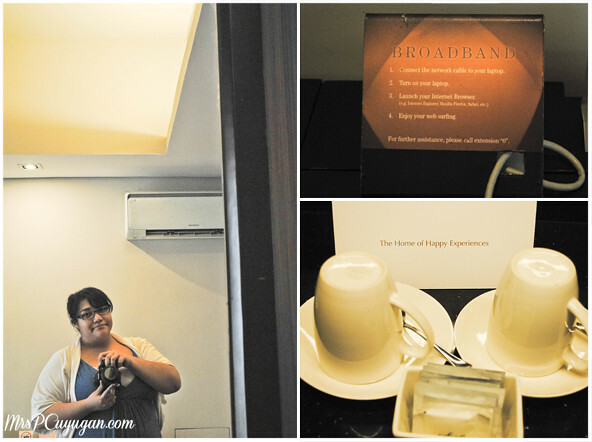 Such was the case when Jane invited the boys and I to spend the weekend at F1 Hotel Manila in BGC together with her family, Joei and Timmy, and a bunch of other bloggers. This was a special invite from the Bossman of KTG, Spanky Enriquez, whom I was looking forward to meeting. 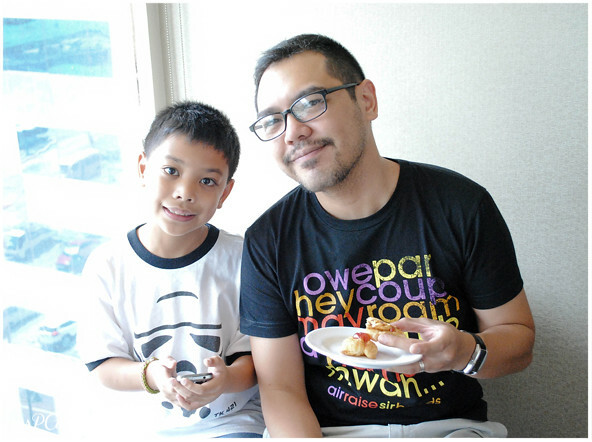 We drove to BGC after a football morning in Alabang, together with Joei who hitched a ride with us. Jane and Boss Spanky welcomed us when we arrived at F1, and we were given our itinerary for the weekend. I was excited to see that my mommy blogger friend, Jackie was spending the weekend at the hotel, too, with her beautiful family. Our weekend started off with a short Halloween program with games and giveaways for the kids. There were snacks, refreshments and coffee, too, and the boys happily munched away. Football leaves us all hungry, so we were super looking forward to the yummy food we were going to indulge in during our staycation. 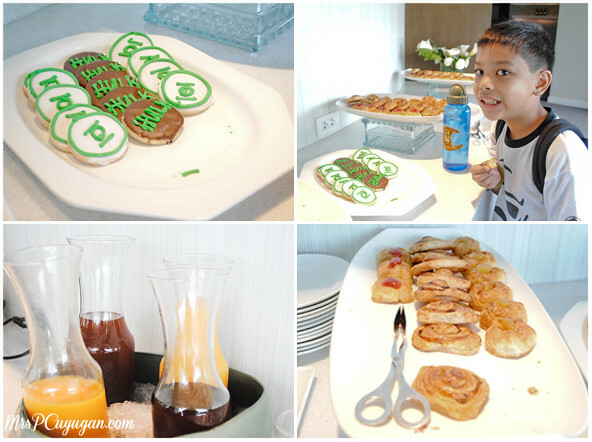 The kiddo really liked the Green Lantern and Hulk cookies! Next on our itinerary was lunch at the hotel’s F All Day Dining, where we were given a sneak peek at their Christmas buffet. I’ll be writing about our breakfast, lunch and dinner at F1 in a separate post though, so suspense muna. Full and sleepy after lunch, we were ready to head to our room. When we walked in and I saw the sofa bed set up in the living room, I got so excited because I knew right away that MrC and I would have our own room for the night! After 8 years of the 3 of us sharing a room, it felt so nice to have a room to call our own, even just for a night. MrC was happy about having our own room, too! Truth be told, it felt a little weird, too, not being able to see what the kiddo was doing on his own bed and what he was watching on his own TV. We also stayed with him until he fell asleep, then we moved to our bed after. Hello, separation anxiety! I know for sure that the little boy had fun with our setup, too, though. Two beds, two airconditioners, two TV sets, wired and wireless internet connectivity, and a big writing desk. All these made me very happy with our room. I also noticed that there were a lot of power outlets, and that’s something I appreciate. We always seem to have so many gadgets that need to be charged all at the same time, and I’m happy we were able to plug everything in all at the same time. 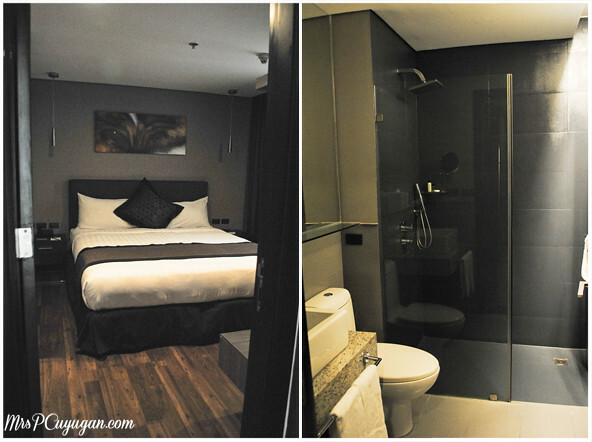 The whole suite was super spacious, and that was such a welcome change from our usual cramped and cluttered room. Plus, there was a Quezo de Bola Cheesecake waiting for us inside! Oh my gosh, way to make me happy! Our room was a Fort Suite (PHP 13,100 per night). 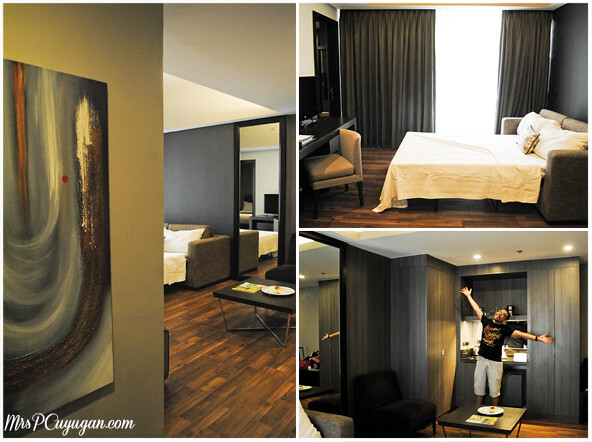 This room can accommodate a maximum of 2 adults and 2 kids, and includes breakfast. Here’s a tip from our friendly hotel housekeeping guy – when booking, ask for a corner room because these are generally bigger than the middle rooms, with no added cost. Other room types available at F1 Hotel are the City Suite Room (PHP 10,700 per night) and the Deluxe Room (PHP 9,500 per night). MrC and I signed up for massages, but unfortunately I fell asleep before my schedule so I missed out on what would have been the first massage of my life. The husbandry was able to get one, though, and judging by how soundly he slept, it looks like it was a relaxing massage. We actually spent most of our staycation in the room because it was a rainy weekend and the weather was perfect for snuggling and being lazy. And because we got to do just that, the boys and I were happy with our F1 Hotel experience. If you’re planning to visit F1 Hotel, you may want to avail of their Thrills and Treats promo which runs from October 27 til November 2, and already includes 2 tickets to their Marvel Madness Halloween Party happening on November 1. Sounds like something fun to do with the family! My sister won an overnight stay at F1 hotel and she said the hotel is love. The breakfast buffet is awesome. I want to have a staycation there! Wow, 13K??? I’m sure it’s really worth it, but still, haha! Love that Little Mr.C has his own room, own bed, own tv! We’ll have to prepare for future staycation expenses cause I’d love for my kids to have their own roomto themselves, too. Wow! Quality time with Mr.C!! (: ayiee!